Mid-Intermediate Level. 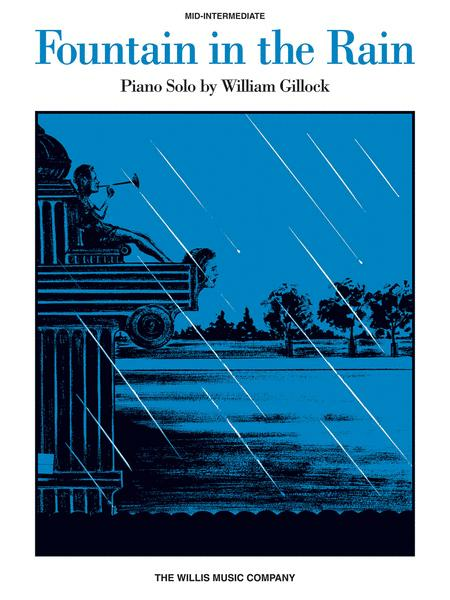 Composed by Wiliam Gillock. Willis. Mid-Intermediate Level. Solos, Recital. Single piece. 4 pages. Published by Willis Music (HL.414908). 9x12 inches. Key: F major. William Gillock Mid-Intermediate Level. A sophisticated Gillock classic popular around the world! Composed in 1960, “Fountain in the Rain” is reminiscent of impressionism and continues to be on annual recital lists. Students particularly enjoy the changing harmonies and nailing the splashy, gorgeous cadenza in the middle! build up speed, then it will eventually sound very much like a fountain running into the falling rain, much like a waterfall. Like I said, it's been a great practice study piece for many years, and sounds very beautiful. A lovely composition that pleased all my audience so much that they wanted to hear it again! One envisions sitting by a fountain in person. The piece has been around a long time,and always makes a big splash.Although it is Level 4+, less advanced students are often motivated to rise to its challenges.The harmonies are interestin and sophisticated, and it uses the full range of the piano. October 26, 2007 Absolutely beautiful! My student was absolutely so excited to learn this piece of music. It is one of the most beautiful pieces ever written. It gives you goosebumps just listening to it. 10 out of 10!